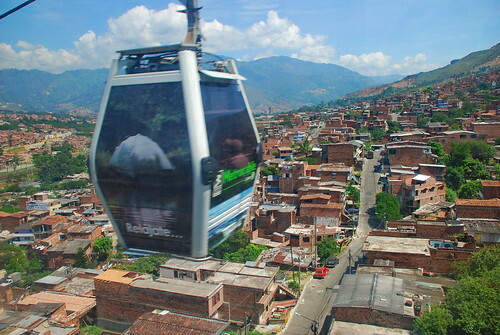 In recent years Medellin has really undergone a transformation. When my parents first moved there, it was still fairly dangerous. However, nowadays it has very little to do with its bad reputation and its Escobar-entwined past, as shown on Entourage. There are a couple of spots of interest for Art Lovers. Museo de Antioquia – It’s kind of hard to miss the Museo de Antioquia because of the Plaza Botero out front filled with giant statues by the Colombian Master. It is a great place to get an overview of Colombian Art, from pre-Colombian to the present day. Museo del Arte Moderno – On our most recent trip, we visited their Museum of Modern Art. 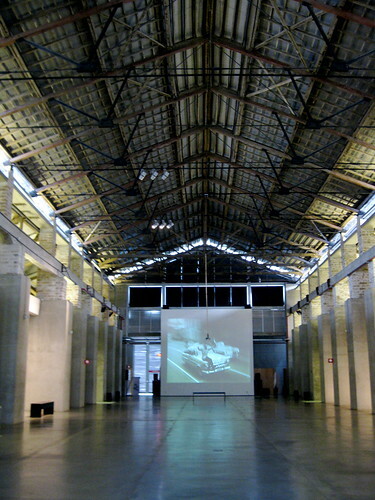 I was really impressed by the beautiful reconverted warehouse space. 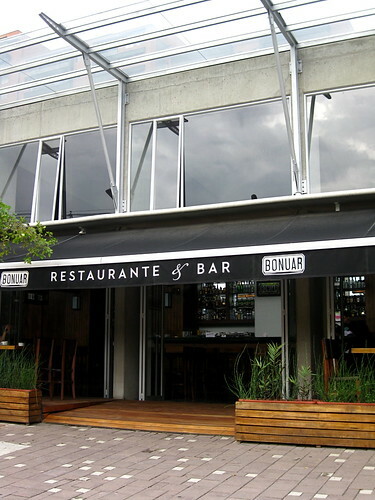 After you’re done viewing the work, grab a snack and a cocktail at Bonuar, the restaurant and bar attached to the museum with a cool, relaxed vibe. I can vouch for the mojitos, but the menu looked pretty good too. 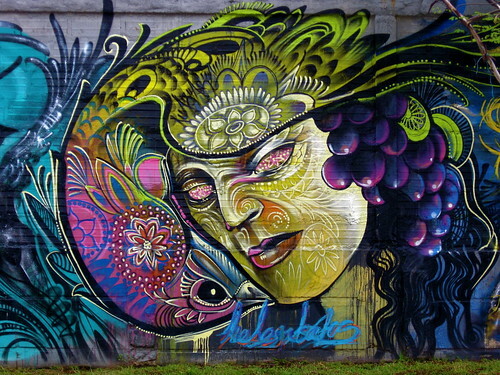 Also, don't miss the beautiful graffiti panels on the wall across the street. The city also has quite a few other museums and cultural attractions. El Museo del Castillo – The gothic, medieval-looking Castle Museum is kind of an odd sight to see in the middle of Medellin. 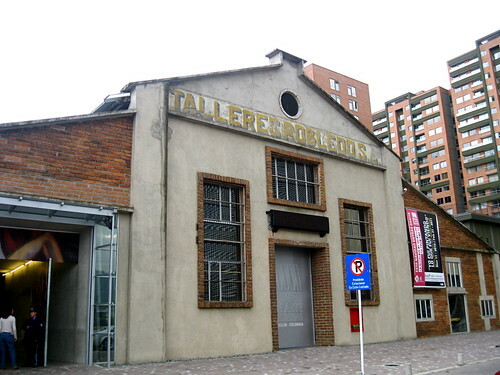 It’s first owner brought plans over from France, and it was a family residence until the building second owner, Diego Echavarría Misas, donated it to the city as a museum and cultural center. 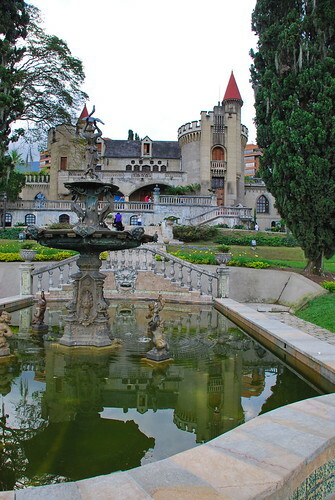 Take the tour to peak into the lives of one rich family, and then take a stroll around the beautiful grounds. 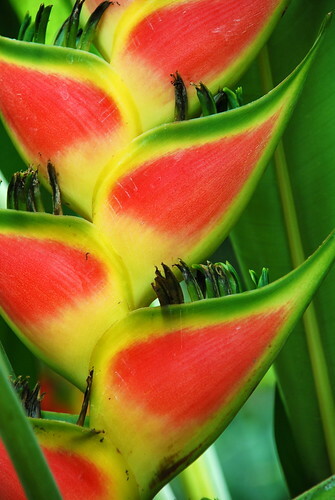 Jardin Botanico de Medellin – A walk through the Botanic Gardens is a lovely way to spend an afternoon. This one has a butterfly house and some particularly pretty flowers. 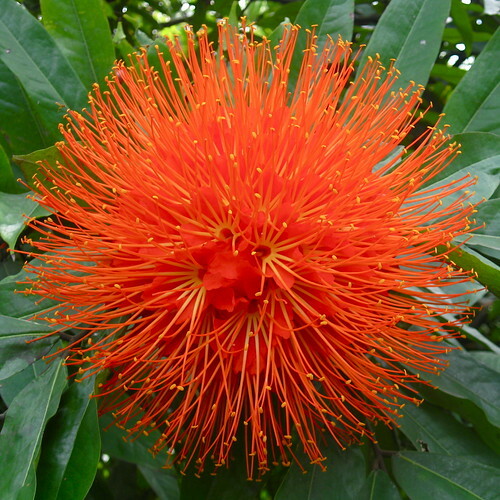 There is even a small section on Religious and Magical Plants – sample at your own risk. Butterflies fluttering around the butterfly house. Medellin also has an Aquarium. I have not been, but supposedly it is quite state of the art. There are also more attractions nearby at the Parque Explora and Parque Norte. If you’re in the mood for something less structured or just want a place to idle away the time, Medellin has a couple of lovely Public Spaces. 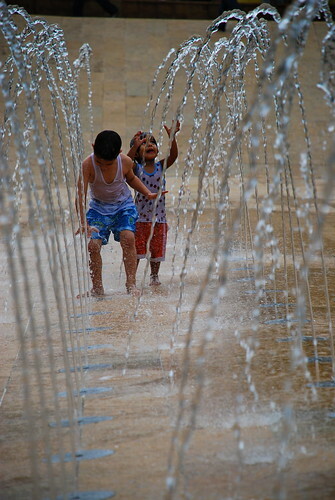 El Parque de los Deseos – Park of the Wishes – has a large patio area and a beautiful fountain. At certain times of the year, they hold screenings of free out-door movies. El Parque de los Piez Decalzos – Barefoot Park – provides an interactive experience. The idea here is that you can kick of your shoes and feel different textures on your feet as you moves through different elements like sand, water fountains, and a bamboo garden. Cemetenterio San Pedro - It might be a little unconventional, but on this trip we stopped into this cemetery and it was a surprisingly pretty place. 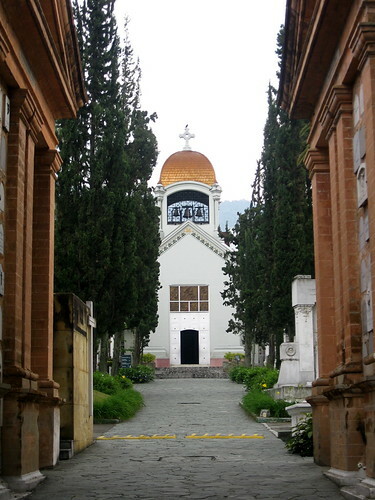 The chapel and mausoleums make an interesting backdrop for a contemplative stroll. I loved the little swallows were flying around the cemetery. I thought they had a melancholic beauty. 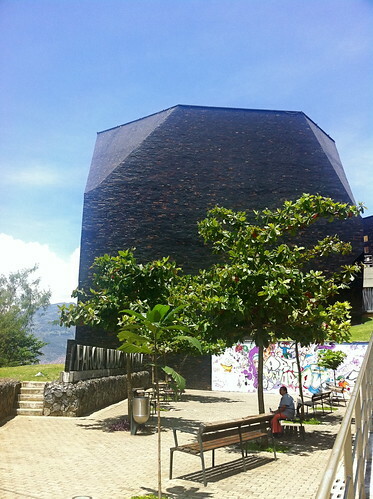 Biblioteca España - The Spain Library is located at the top of a hill overlooking Medellin and it’s a very interesting piece of modern architecture. The Spanish government made a donation that made the construction of the library possible, hence the name. The library is located in a barrio called Santo Domingo Savio, and its construction in 2007 has really helped to begin to revitalize the neighborhood. Side view of the Library. 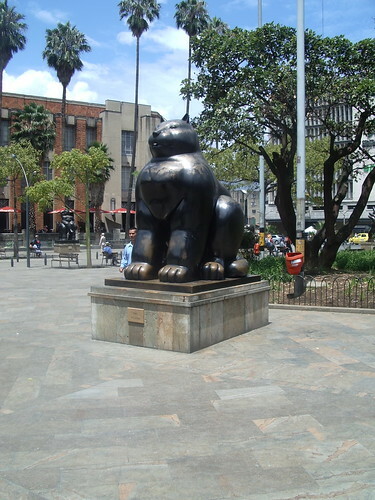 You reach the library via Medellin’s Metrocable, which is an attraction in itself. The trip up to the library gives you a chance to see some great views of the city – and I promise the heights aren’t too scary. If me and my fear of heights can take it, so can you. 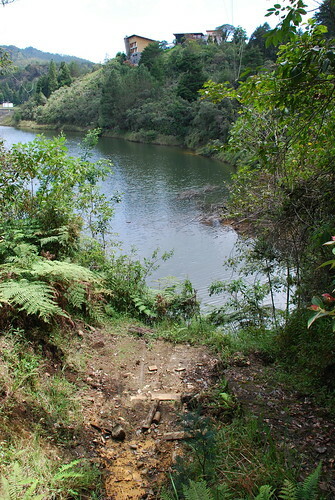 Parque Arvi – You can also take a Metrocable to reach Parque Arvi, a nature reserve on the eastern edge of the city. We’ve been to the Piedras Blancas (White Rocks) section of the park, which offers attractions like zip lining, kayaking, and an insect museum. If one day in the great outdoors isn’t quite enough, lodging and campsites are available. Shopping – While I’m not the biggest shopper, like every girl, the urge does take hold every now and again. In Medellin, I go for shoes and bags. Two of my favorite chains are Vélez and Boots 'n Bags. A partial selection of my collection of bags from Medellin. There are many very nice malls in the city. (This site lists most of the major ones. Santa Fe and Premium Plaza are two additional malls.) Just one note -- prices vary by neighborhood, with the most upscale neighborhoods having higher prices. Oviedo and El Tesoro are pretty places to spend time window-shopping, but I think San Diego provides a happy medium of slightly lower prices, while still maintaining a relatively pleasant atmosphere. If you’re feeling ready to fight the crowds and haggle a bit, head to El Hueco in El Centro to hunt for bargains amongst the sea of vendor stalls. 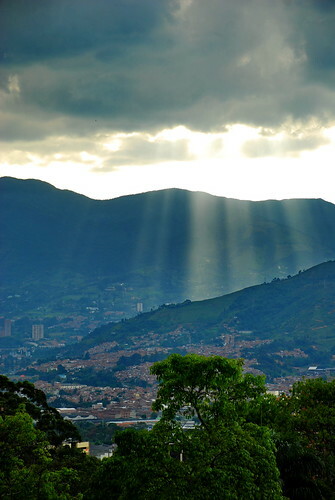 Medellin is one lovely city that has been long overlooked by tourists. In truth, they're still playing a bit of catch-up and not every section is fully ready for international tourists and there isn't much in the way of translation help, even in the most touristy spots. However, they're moving forward fast and everyone that I have spoken to that has had the pleasure of visiting in recent years, couldn't help but be enchanted by the place. Obviously, I have also fallen under the spell. Click here and here for more tourism info. Here for the Lonely Planet Guide.